The young adult fantasy, Return to Arèthane, takes you through worlds that you can only imagine. Kelly Riad is a vivid storyteller who's words are filled with loyalty, friendship, and love. Return to Arèthane started out really well; it was engaging and Emily was the biggest focus. She's the girl with a messed up home life and one true friend, Dafne, who's sunshine and rainbows but burdened with a secret. It seems that when the secret reveals itself in the form of Dafne's brother and sister, Emily is pushed towards the background. Emily has a strong presence in the first half of the book, even when she learns what Dafne, Jarrad, and Kara are. However, once the adventure begins, it's like she's always in the way or holding the non-humans back. Emily doesn't stand on her own in unfamiliar territory. Despite not having too strong a heroine, Return to Arèthane has its strong points. The story is creative and magical, and the adventure is prominent. The characters all have a way of bonding with one another so that their interactions are fluid and believable. The biggest reason to keep reading is to see where Jarrad, Emily, Dafne, and Kara end up. Their journey isn't simple or straightforward, but doused with unpredictable danger. Riad has made this story universal and entertaining. 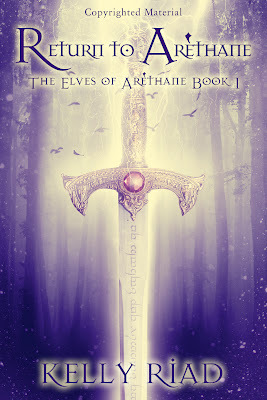 Return to Arèthane is fantasy that any reader can enjoy. What helps you keep a happy outlook on life? I have so much--a caring, supportive family, awesome best friends, and a super cute boyfriend--that I have no reason to not be happy. And I've lived long enough to see that the bad doesn't ever stick around for long, so there's no point in letting it get you down. Which do you prefer: rainy day or sunny day? Definitely sunny--my hair can't handle rainy days. I think I'm the only elf who has to battle frizz! Who’s your favorite sibling: Jarrad or Kara? Oh my gods, I can't answer that! You've seen what they can do, right? They'd totally kill me or worse! I love them both the same, but in different ways. Between the two of them, who would you rather accompany you on a double date? Okay, yeah, that one I can answer--definitely Jarrad. He's a lot of fun. Not that Karawyn isn't fun! She probably wouldn't want to go anyway, and would end up scaring Sam. Besides, a double date with Jarrad would mean my best friend, Emily, would be there, too. What do you love most about living with humans? It is never boring. Humans live with the pervasive knowledge that life is finite so every minute counts. They seem to embrace their maelstrom of emotions; when they're mad, they show they're mad. When they're happy, they show they're happy. Elves just aren't that way--it's too important to remain calm, to think things through and wait for what may happen. Humans live like every moment's their last and I love that. What is your favorite book, movie, and song? My favorite book is Dune, by Frank Herbert--I'm secretly a bit of a sci-fi fan girl--and my favorite movie is Tristan and Isolde; James Franco is so hot! Right now I'm on a bit of a Kings of Leon kick (Jarrad turned me on to them) so for favorite song, anything by them, but if I had to pick one, I would say Holy Roller Novocaine. Thanks for stopping by Dafne! Any parting words for your fans? Oh my gods, fans?! I feel so special! I guess I just want to say thank you for letting our story be a part of your lives and I hope that in some way, we connected to you. And know that it doesn't end just yet--there's plenty more excitement and adventure to come!